I won’t lie, this stuff tripped me out when I first saw it. I was walking through Byron and little shop had these massive leather tote bags in all sorts of metallic colours. The shop owner saw me touching them (because I’m like a 4 year old and have to feel everything shiny), and asked if I knew what is was made of. “Feels like painted leather” I said. “Nope, it’s paper!” She replied, smiling as the shock moved across my face. I spent that entire night frantically googling this mystical material. The makers of bags are called Uashmama (who have a whole range of cool things), and call it ‘washable paper’. It feels exactly like leather, but it’s a manufactured paper product that’s a vegan alternative to cow hide. I’ve even seen their stuff pop up in Newcastle now, at one of my favourite Hunter Street shops, Studio Melt. I don’t know exactly their source, but commercially it’s available as Kraft Tex (or KraftTex, Kraft-Tex depending on where you look). But with some more research, I discovered that this isn’t some new technological miracle, it’s been around for ages. If you own a pair of jeans with a leather name tag on the back, it’s probably not leather, but this Kraft Tex. Of course I bought some. It comes in bolts like fabric, but feels like card stock. The website said to wash it once to give it a bit of texture. So this weekend, I decided to see what happened when I washed a bit. I didn’t send them through the machine, but soaked them in boiling water for ten minutes. After they became soft, I crumpled them and molded them a bit to get that rough texture. 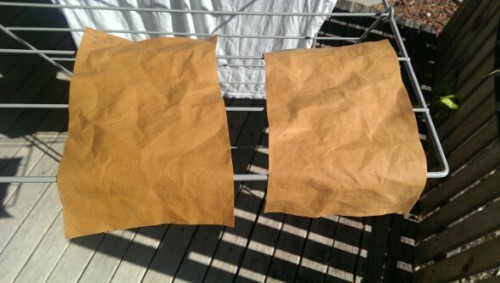 After drying, as if by some miracle, it turned into a really supple leathery material! The next level is seeing how well this takes fabric paint. I bought some silver over the weekend, and in my head I have some really cool accent pieces for tote bags I want to do. Love this! I also stumbled across this paper at the Olive Tree Markets, I too started googling but can’t seem to find many Australian suppliers… Where did you manage to find yours?